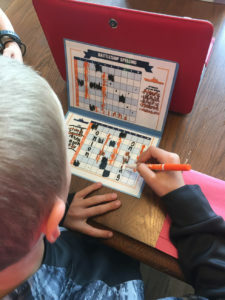 As I have been homeschooling for 4 years, I have learned a lot of things that help my boys learn faster. They love games and competition. 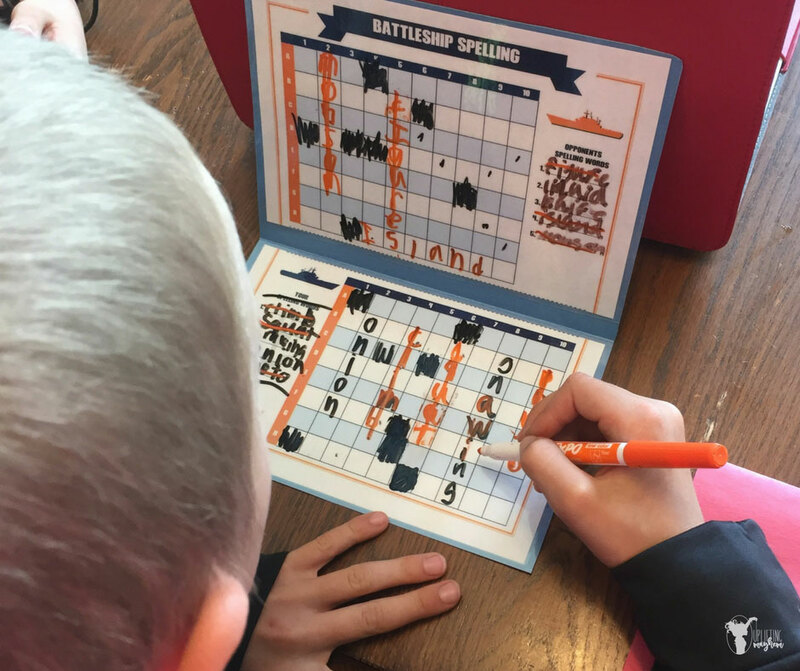 Spelling battleship is the perfect combination that my boys love! Homeschooling should be about quantity and how fast you get through things. It’s about instilling something greater inside the hearts of your kids. My boys spend hours playing games with each other that instills something educational inside them. Guess what? They love it! This game takes a little time, but the amount of time they spend on those 5 words is a lot, and more importantly they are spending 1 on 1 time with their brother/sibling/friend that will be committed to memory for a lifetime! This list is so your opponent knows your words. If your kids are older you can leave this list off to increase the level of difficult. Doing this will make it so the kids have to try and guess the words as the letters are revealed. As you write your words out, put one letter in each box. You can’t go diagonally but everything else is legal from side to side, backwards, or even a word sharing a letter. Choose who is going first and that person calls out a number and a letter. For example; say out loud “A1”. Your opponent will look on their bottom grid to see if there is a letter in A1. If there isn’t a letter, the opponent says, “MISS”. You now mark out that space on the top grid so you know not to call that number again. If there is a letter he announces what letter it is. You now write that letter he tells you in the upper grid in A1. 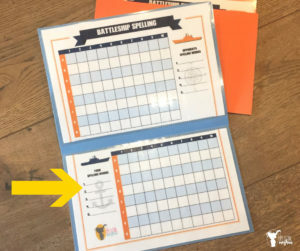 #5 – Continue taking turns trying to find your opponents spelling words. Once you find a spelling word, continue until all the spelling words are found. The winner is the first to find all the spelling words. 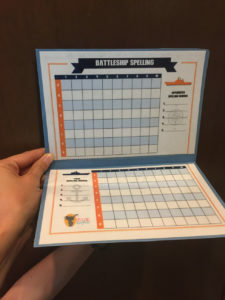 This is such a fun game, and my boys LOVE it! The free printable attached can be used in a couple different ways. 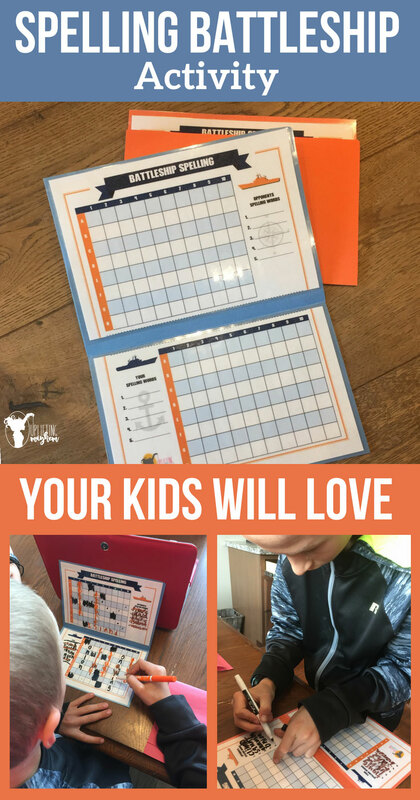 The first way is simply to print it out each time your kids want to play. You will need one copy for each child. Use a book to block the view from your opponent so they can’t see your words. You can do this in color or black and white. The other way is to make a reusable card that can be used over and over again to save on paper. Here is how to do that. 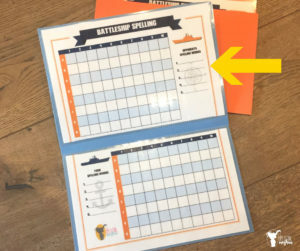 Step #1 – Print out 2 of the attached spelling battleship printable. Step #2 – Laminate each one and cut on the dotted line. Laminators are cheap and very nice to have on hand! On each folder tape the top portion of the printable so it lays right above the crease of the folder. 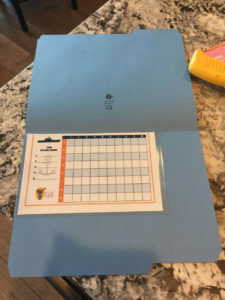 Tape the bottom portion so it lays right below the crease of the folder. 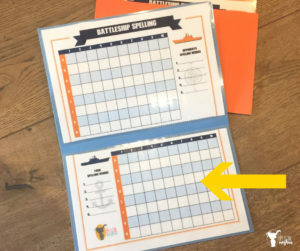 Step #4 – Cut the folder around the edge of the spelling battleship printable. 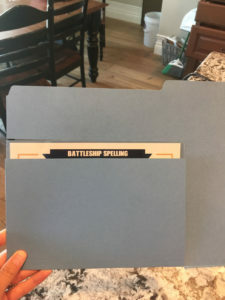 I made it so the battleship spelling title could be seen when the folder is closed. This is completely optional! You are done!! Use dry erase markers with an ultra fine tip to make writing easier for your kids.